An outdoor wedding reception at the Candlelight Farms Inn is a dream for a Farm Wedding Photographer. The inn, which dates back to the mid-1800s, was named for the time long ago when the property did not have electricity and gatherings were lit by candles. The property has since become modernized, but it continues to keep the rustic, romantic vibes of its past. The venue provides couples with a perfect balance of country charm and elegant beauty. The intimate atmosphere of the farm and inn create a lovely setting for a Farm Wedding Photographer to take pictures in. The farm has multiple areas for unique pictures with a working horse stable, riding trails, vast fields, and a scenic lake. This photo shows a wedding reception in the field of the Candlelight Farms. On long wooden tables, glassware sparkles under the late afternoon sun. The water glasses filled to the brim and wood folding chairs await the arrival of wedding guests. The tables are covered with plain ivory clothes and gold embroidered runners. Small silver buckets hold flowers in varying colors of early fall. Open faced deep tangerine roses, sunflowers, and small purple buds reach from the buckets out into the fresh farm air. 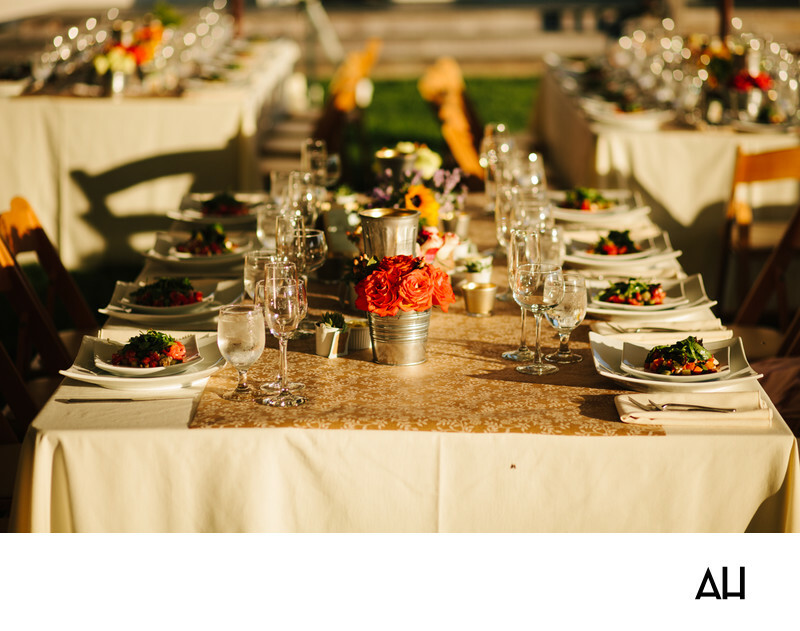 Also on the tables sit beautifully plated salads in varying shades of red and green and small candles, fitting for this venue.Sunlight dances over the place settings, casting shadows around the area that has been prepared for the reception. It is a calm scene before guests arrive and the setting is filled with sounds of music, laughter and happy chatter.